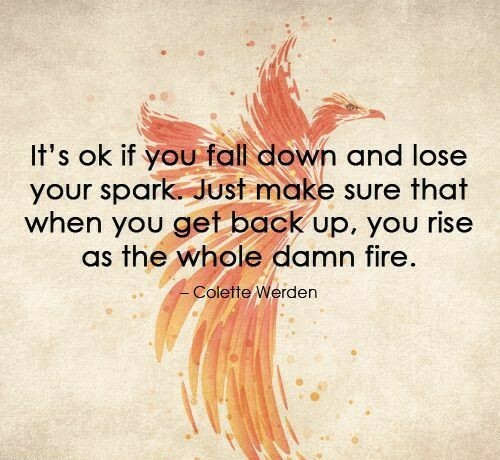 Everyone has ups and downs in life; times when we lose our spark. And how up the ups are and how down the downs are vary from person to person. It’s not up to us to judge another’s emotions or challenges. Do we make mountains out of molehills from time to time? Abso-freaking-lutely. And conversely, are we sometimes too nonchalant about things? Definitely. But, often it’s not until after the fact when you realize the true “size” of whatever you faced. The important thing is this: whenever you find your spark again, no matter how long it takes you to get it back, rise like a damn fire. Stephanie – That is such good advice. I think Grandma and Grandpa worked very hard to keep a positive attitude and see the good things around them. They are both known for their happy laughs and smiles. We can learn from their example! Oh, Steph, after my water catastrophe, I really needed to hear this – thanks! !